When Microsoft launched their Windows Genuine Advantage protection they thought they had solved their greatest problem. 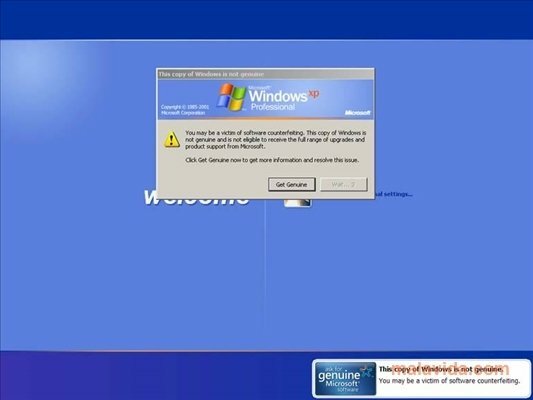 The intention of this patch was to make sure that the copy of Windows installed on a computer was original to offer more possibilities to those that passed the test. Nevertheless, many users saw how their legal Windows were marked as non-genuine and could no longer use the Windows Genuine Advantages like updates or new programs. That is why many of these users started to use RemoveWGA. This software only removes the notifications, in other words, you won't make your Windows seem original, but you'll eliminate the notifications and other bothersome inconveniences that Microsoft prepared for those that didn't pass the test. Thus, RemoveWGA is a good program to have at hand so that we don't get any surprise when a software update or download tries to validate our copy of Windows. Once the notifications have been removed from the system, RemoveWGA will show the following message: "Microsoft WGA Notification Tool is not currently active on your system", thus verifying that the process has been completed successfully.